Yorkies (Yorkshire Terriers) are a small breed of dog with a long, silky and non-shedding coat. Because the hair of the Yorkie can be difficult to manage at long lengths, many owners prefer a shorter grooming style that will enable a higher level of activity without the fear of a matted or tangled coat. Whether you keep your Yorkie with a long coat or short coat, weekly brushing and a regular bathing routine are necessary for optimum skin and coat conditions. The puppy cut is the most common short grooming style for Yorkshire Terriers. This cut gets its name from the style mimicking the length of the Yorkie's coat as a pup. A puppy cut on an adult Yorkie is generally 1 1/2 inch to 2 inches in length all over the body. The ears, feet and tail are also trimmed down to the same length with this grooming style. The Westie grooming style is similar to the puppy cut in that the coat on the body, legs and tail of the Yorkie are cut to less than 2 inches. In some cases owners will shave these areas closer to the body as well. However, the facial and head hair are left long, about 2 or 3 inches, depending on your preference and height of your Yorkie. This cut allows for the texture of the coat to be viewed and offers a frame around your Yorkie's face, and drastically reduces the possibility of knots and debris getting caught in the tail hair. The standard Schnauzer grooming style is the same cut used for the Schnauzer breed. This type of cut trims short the dark or silver areas of the Yorkie's coat to about 1 inch or less and leaves the tan or cinnamon color areas such as the legs and face long. The length of the tan areas can be as long as you want. The modified Schnauzer cut trims the "saddle" (down the middle of the back) of the coat short and allows for variations in length on the face, legs and tail. Another variation of the Schnauzer cut is the Chinese Crested cut, which is a short "saddle" and long leg, tail and face hair. 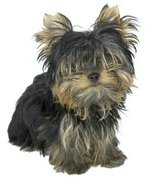 There are several variations and hybrid grooming styles for Yorkies. Groomers will take into consideration specific requests by the owner. If you prefer to give your Yorkie a puppy cut in the winter to reduce grooming requirements, consider using a sweater or T-shirt to help maintain healthy body temperatures.